Omnitrol has pioneered the delivery of the industry's most advanced cloud-to-edge (FOG computing) IoT software platform. With the advent of IoT a new paradigm of real-time operational intelligence is rapidly becoming a reality. The industry is quickly evolving to delivering services on cloud-based hypervisors that can scale to meet the demands of big data analytics and information dashboards by processing real-time sensor data to achieve paradigm-shifting improvements in productivity and operational efficiency. Omnitrol has developed a unique software approach to deliver the benefits of cloud-based solutions that can be hosted securely within customer premises or on our securely hosted cloud infrastructures. Our unique EASE-V8™ IoT Engine enables a powerful approach to distributing IoT services from the cloud to edge based servers or industrial appliances. Placing business logic application intelligence at the edge of the network is essential to real-time M2M automation and to scale the onslaught of massive data that is generated from IoT smart devices and sensors. 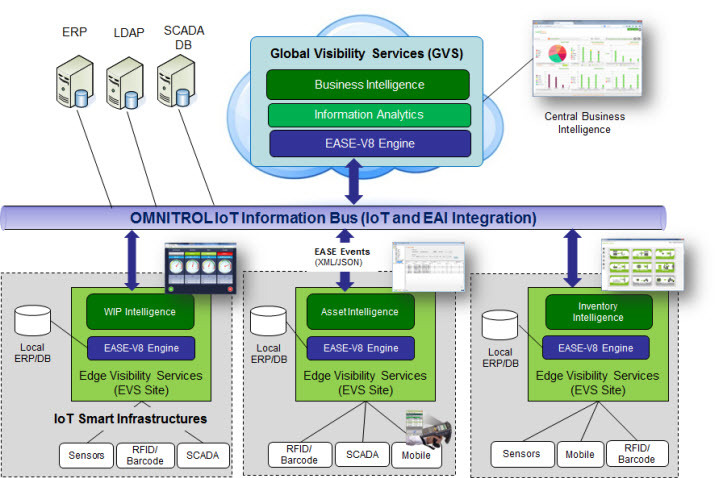 Only Omnitrol has such a distributed IoT operating system that creates a pervasive peer-to-peer application framework that connects Edge (FOG) computing with cloud-based big data analytics. Our software architecure seamlessly melds the cloud-to-edge in to a single computing Smart Infrastructure™ platform that runs IoT micro-services (Edgelet's™) on the edge or cloud, achieving maximum benefitts of IoT and optimizing micro-service execution. 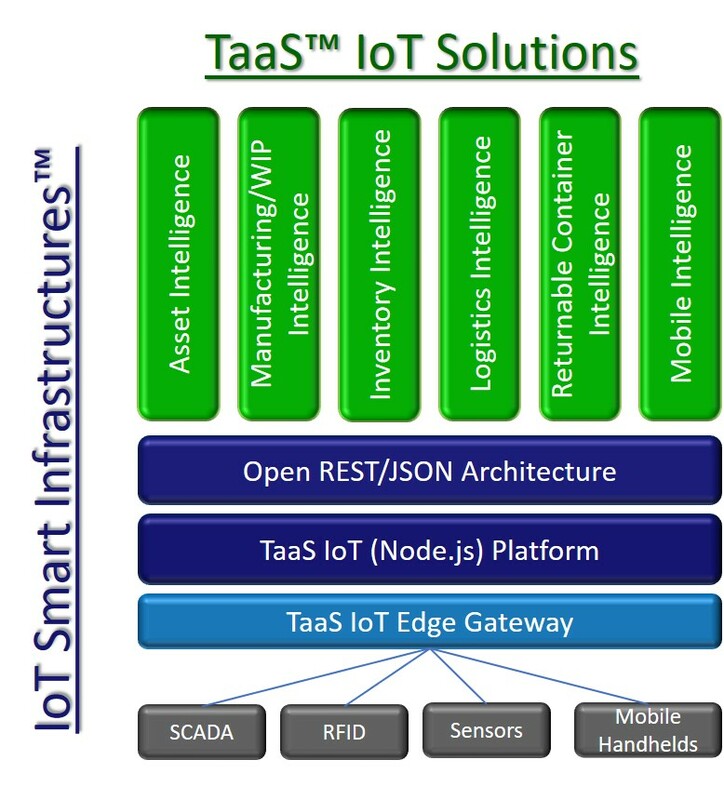 The integration of IoT for business process service execution at the edge not only minimizes deployment costs but substantially simplifies smart sensors integration without disrupting existing business processes and site specific ERP systems. The ability to provide real-time analytics at the edge also enables site specific process intelligence, reduces complexities and speeds up decisions process right where it is needed. Our distributed micro-services architecture simplifies workflow development and deployment to exacting requirements by site, operation and/or organization. Real-time opertaional intelligence is ultimately about solving operational challenges that varies between operations withing the same enterprise, which in turn, accelerates ROI and customer satisfaction by transforming IoT into relevant business intelligence that is actually used. 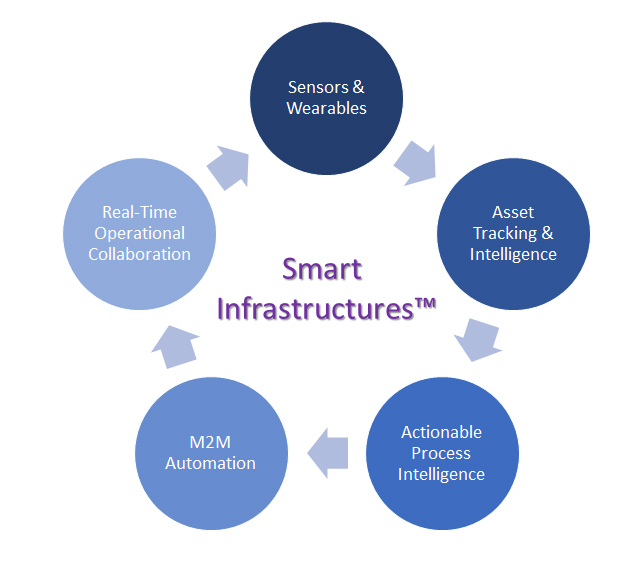 At Omnitrol, our experience in transforming operations in to Smart Infrastructures™ has become our passion. Our unique IoT software solutions and architecture have repeatedly improved productivty, staff effeciency & effectiveness, reduced inventory loss and waste, proactively manage process errors and exceptions, achieve regulatory compliancies and optimize resource utilization. Fundementally, real-time asset visibility is leading to a new level of process intelligence and shop-floor to top-floor collaboration. Omnitrol has successfully transformed IoT to achieve these goals in WIP tracking for manufacturing operations, enterprise asset & tool traceability, supply chain traceability, returnable asset tracking, bio-hazard monitoring for environment sustainability, retail inventory tracking, worker safety, to name a few. As a result, our enhanced operational-driven Smart Infrastructure's™ ultimately help our customers exceed both employee/management and their customer/partner satisfaction objectives. Omnitrol has pioneered the delivery of unique IoT Smart Infrastructure™ solutions with market leading Fortune 500 corporations. Our unique software architecture has be successfully deployed in some of the most challenging production environments. Our vision in delivering real-time cloud-to-edge business and operational intelligence solutions have proven the convergence of advanced sensor network technology with existing business process has become a reality. If you are looking for industry veterans to assist in your IoT initiatives, you need not look any further. Call Omnitrol and we will be glad to discuss your challenges and how IoT and our solutions can fit your needs. Copyright © 2018 Omnitrol Networks, Inc. All Rights Reserved.